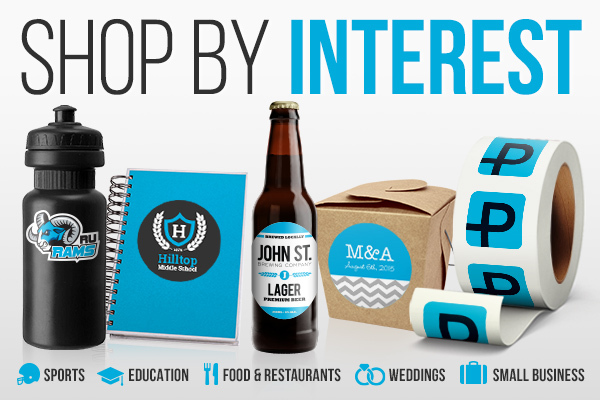 Shop By Interest at StickerYou! At StickerYou we strive to make sure we are offering the most comprehensive, high quality, selection of custom stickers and goods. Curating online galleries of customizable templates is an ongoing process for us. We are always working to make sure you can find exactly the sticky product you are looking for, and we hope that you are inspired by the other products we offer on our site as well. To make this product search process even easier, we have recently added a section to our website called Shop By Interest, and- as you may have already guessed- it allows you to do just that! The Shop By Interest page on our website houses different products, broken up by specific "interests". By clicking on a category that applies to you, you will open up a new page which features all the different products you may find interesting. For example: if you are a photographer, simply click the Photographers category to open up the window that has all the different sticky product photographers might want. Such as photo stickers, product labels, logo stickers and more. If you are a parent, you may be interested in different products all together. So clicking the Parents & Kids category will bring up more kid-related products, such as durable name ID stickers, and allergy stickers. To narrow down the search for products, and to be inspired by other products that may be of use to you, simply go to the home page, click on Shop, and scroll down to the Shop By Interest menu. Make sure you check back regularly as this part of the website is constantly being expanded to include more products and categories.